Hear, hear! Make some way for the rugged, raw and rage because sugar, spice, and everything nice has taken a backseat for a while. Flaunting their determination and posing victoriously through these glossy visuals, are these women chasing the glory of sports. 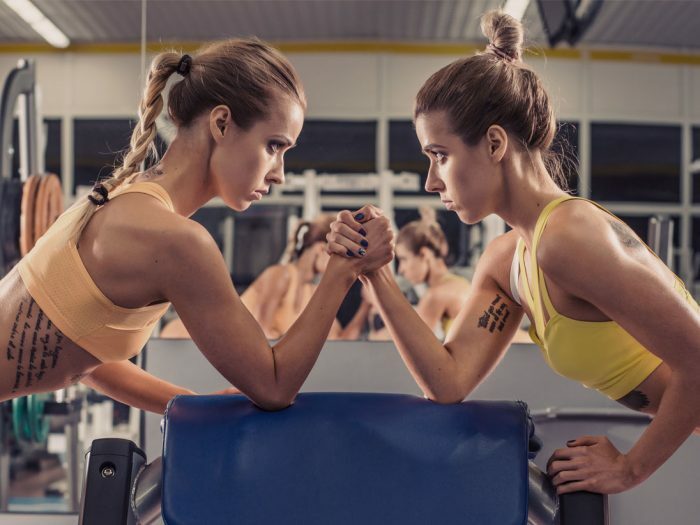 Gracefully placing the gender with guts on a high pedestal, Nike and Reebok, both global giants in the world of sports pushed out a campaign enriching the role of females as athletes. Always optimistic and heartening even through their tagline, Nike now asks you to ‘turn no into let’s go’ through their exceptionally appealing film which is doing rounds on social media, steadily and actively gaining the title of virality. The female sports scene in India brings out just enough names to count on your finger-tips, but through this campaign, the film unmasks the ladies of the sporting world in their most stylist sports skin. More of a music video with exceedingly catchy tune which goes #DaDaDing, some à la mode rapping, featuring gorgeously sweaty, athletic, and gritty women. Viewing all sports without prejudice, Nike sheds light on everything from running, basketball, badminton, cricket to football, wrestling, and more with the anthem bursting in the background. Contributing along with the Bollywood Queen bee, Indian women athletes such as hockey player Rani Rampal, footballer Jyoti Ann Burrett, and cricketers Harmanpreet Kaur, Smriti Mandana, and Shubhlakshmi Sharma are shot training, ultimately breaching conventions and re-defining the contribution of women in this field. Disclaimer: Resisting will be pointless, because you won’t be able to get the Da Da Ding out of your head. Dedicated to the immense determination, courage and grit of women which has been crushed or shushed by the evils of the society, Reebok putting actress Kangana Ranaut in the center of the screen released a video, a couple of weeks ago. Briefly, the video speaks volumes about her personal and career journey and through that, urges the audience to absorb inspiration and implement that in their lives. Sharing with the digital world her intimate social-shaming stories, within a dusty, pale room stands alone Ranaut in a neon green Reebok gear. Directly, drawing a connection with fitness and its direct impact on our lives is the brief of the entire film. Through its film, Reebok promotes itself through a message of #FitToFight. Towards the conclusion, Ranaut also personally calls out to her audience to tell her such stories of their struggle, determination, and passion, and how they ultimately rose from scratch despite resistance, with the promise of sharing it with the world. These stories were not restricted to the sports genre which the brand originally stands for, but overall vigor of women were acknowledged. Though we got two Bollywood beauties, it’s not another brawl to top the silver screen but to impact the sports scene. They both have a message to share, but chose different ways to tell. To portray contrast between the competitive brands of the same genres where they are putting up a strong fight by placing women of the same professions at the front as well makes it even more exhilarating. 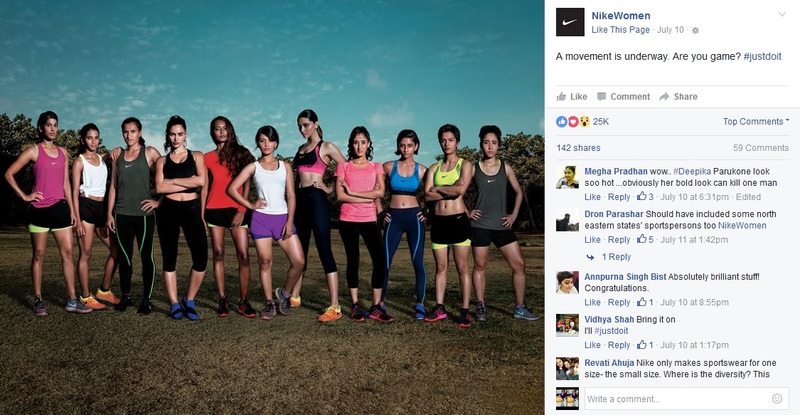 To begin with, Nike collectively squeezes sportswomen of varied games under one video, doing justice by giving equal emphasis to the sport and individual representing it despite the presence of a famed personality in the frame. and thus giving viewers an opportunity to witness their grandeur and grace in their sport. Whereas, the story changes with Reebok which throws its entire spotlight on the strong woman, Kangana Ranaut giving an insight of her personal life, making it more intimate with the viewers. Here, through their music video Nike explores more dauntingly the already established games, introducing the Indian faces representing it, while Reebok talks about fitness, willpower and its direct impact on our life making it comparatively sterner as compared to the upbeat, playful video. 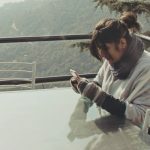 Influencers under today’s norms are easily the meat-providers of a brand’s campaign and it’s absolutely common for brand giants to chase Bollywood for their representation considering the fondness towards the movie stars. Relatable in both these scenarios, they picked Bollywood biggies Deepika Padukone and Kangana Ranaut to faintly nurture the topic of women empowerment through their video along with the big picture. Though Nike earns brownie points for getting Padukone who already has the feather in her cap for being a National level badminton player, but Reebok choosing self-made Ranaut is apt according to the demand of its script. The very recent campaign by Nike geared up some Twitter conversations between All India Bakchod’s Rohan Joshi and Dave Besseling about the inclusion of a Bollywood personality in a sports oriented video. Both had their share of argument and lay across relative points to defend themselves. @mojorojo @supriyan It would make a more impactful statement without the old Bollywood go-to don’t you think? On Facebook, Reebok had a grander campaign designed under #FitToFight, which was also was known by the know #BeMoreHuman. They outsourced inspiration after headlining the campaign with Ranaut and this extended campaign received 1M views, 18k likes and though was released two months ago, is still active on its social media handle. On the flip side, the campaign of Nike Women was sparkling on social media with 195k views and 8.9k reactions and was shared over a thousand times within a day of its release. With a campaign far more appealing both audio-visually and having the potential of being shared often, Nike seems to have taken the cake by a slight difference. 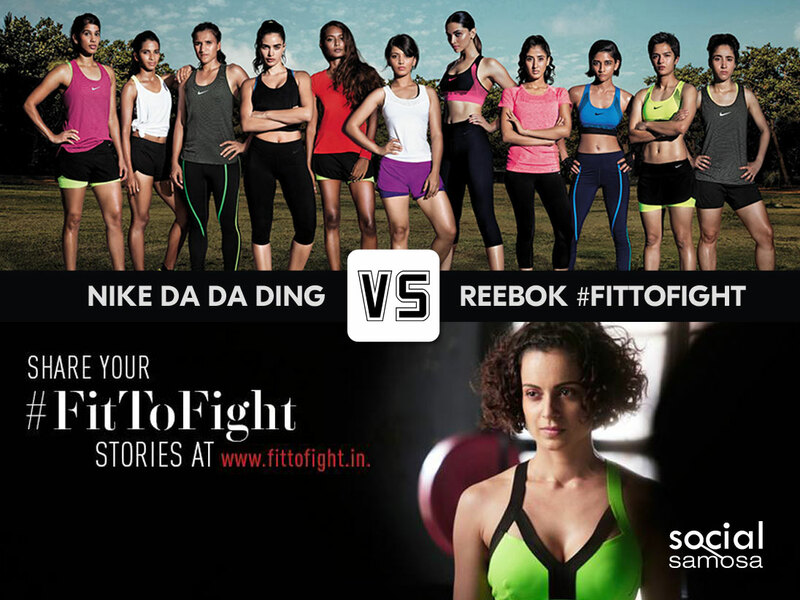 Nevertheless, Reebok voicing with strength manages to capture attention in case of engagement as it aims at crowd sourcing on similar lines. Both, remarkable with their content marketing and having a comprehensible vision of their message manage to make a mark in the digital world and establish themselves individually.